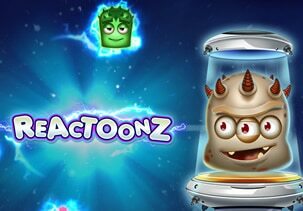 Reactoonz alien theme slot is played on a 7×7 gird and available to play at Slotsmillion on desktop, mobile and tablet devices. The aim in this rather cute unique game is to round up clusters of energetic extra-terrestrials. Reactoonz offers 7 extraordinary bonus features including 5 quantum features. Cartoon style graphics include 4 lower paying aliens, 4 higher paying aliens and a vortex wild. The vortex wild simply replaces all symbols to help form winning combinations. Reactoonz is a cascading game dropping symbols into a 7×7 grid. Winning combinations are formed with 5 or more of the same symbols connected in a cluster. These clusters can be either horizontal or vertical. When getting a winning combination, the contributing symbols are removed with new symbols dropping into the empty grid. In a winning combination, you will increase the 5 Quantum Leap charge meter located on the right 1 by 1. Once the meter is charged, a quantum feature is added to the queue randomly. When all 5 charge meters are fully charged the Gargantoon feature is added to the queue. The Gargantoon adds a 3×3 wild randomly on the grid. With each cascade the Gargantoon divides to become two 2×2 wilds. With the next cascade, it divides again into nine 1×1 wilds. Gargantoon can randomly drop 4 to 8 wild symbols onto the grid during a non-winning spin which is called the Instability feature. A Giantoonz feature is played when 4 matching symbols adjacent to each other in square appear. This will form Giantoonz which means that wins are doubled within the winning combination. Last but not least you have a Fluctuation feature. This is when 1 random low value symbol is marked as the fluctuating symbol on each spin. If it’s part of a winning combination, it leaves 2 wilds in its place.